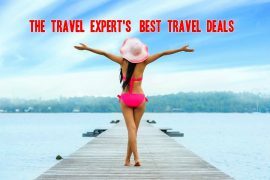 In my best travel deals this week I have a last minute holiday to Lake Garda, bargain breaks to the Canary Islands, a weekend in Bilbao, early booking offers to Orlando and the Maldives and an amazing Celebrity Cruise for next summer. Enjoy a week in Lake Garda from only €383 on the 19th of August. Price includes flights, transfers, checked baggage and a seven night stay in the centrally located Miravalli Hotel. Although only a 2* hotel this receives good reviews on tripadvisor and is an ideal choice if you want to explore Garda and the Italian cities of Venice and Verona. This deal is hard to beat if you are looking for some sun in October. Fly to Gran Canaria on the 5th of October and enjoy a seven night stay at the highly rated Club Vistaflor bungalows in Maspalomas for only €355 per person. Price includes flights, accommodation and transfers. Use my promo code TRAVELEXP10 to reduce cost from €371 to €355. Cruise the Med for seven days on luxurious Celebrity Constellation next summer. Celebrity Cruises are offering 5* luxury at 3* prices! Fly from Dublin on the 30th of June and enjoy a seven day cruise from Barcelona to Venice visiting Monte Carlo, Rome, Montenegro and Croatia from only €1,329! Planning a visit to Orlando next year? Sunway are offering package deals from only €495 per person in March or travel in May and stay at Universal’s Cabana Bay Resort from only €569. Prices are based on 2 adults and 2 children sharing for seven nights and include flights and accommodation! Spend the October bank holiday weekend in Bilbao. I did this last year and loved it! Fly from Dublin on the 28th of October and enjoy a three night stay at the highly rated 4* Barcelo Bilbao Nervion hotel for only €299 per person. Looking for some winter sun that won’t break the bank? Fly to Lanzarote on the 29th of November and enjoy a seven night stay at the popular Tropicana apartments in Puerto del Carmen for only €276 per person. Previous articleOctober Bank Holiday Weekend in Bilbao, Flights & 4 Star Hotel, 3 Nights, €299! Next articleCollect Double Avios points on Back to School Shopping and Triple Avios Points With SuperValu!